It's and we would like to welcome you to the Salt Lake Tourist & Visitor Centers official online edition. This page provides detailed information for visiting Temple Square and the many attractions offered on site. 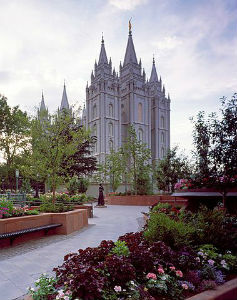 Come visit the wonderful attractions on the thirty five acres of Temple Square located in downtown Salt Lake City. Tour historic buildings and see what life was like back in 1856 in Brigham Young's home, Listen To The Tabernacle Choir at Temple Square "America's Choir" and hear the legacy and history of the Mormon people. Come see how the Salt Lake Temple was built and why it took Forty Years to complete. See the artifacts of Mormon culture and history in the Museum, and search information on your ancestors. These are just a few of the wonderful attractions located at Historic Temple Square. Experience the peace and tranquility of beautiful Temple Square with a complimentary tour of Utah's most visited attraction. Tours of the beautifully landscaped 10-acre property are available in 40 languages. Reflect on the majesty and wonder of God's creations as you stand beneath the star-studded dome in the rotunda of the North Visitors' Center and ponder the invitation of the outstretched arms of Thorvaldsen's Christus, a magnificent 11-foot statue of the Savior. The exhibits in the South Visitors' Center focus on the temple and the importance of families in the Lord's plan for His children. Have a layover at the Salt Lake International Airport? Well, you're in luck! You don't have to spend the afternoon watching planes take off. If you have a layover of two hours or more, take advantage of a free tour of the heart of Salt Lake City-Temple Square. Go to airport information desks in terminal 1 or 2 and ask for a shuttle brochure, which shows time and day schedules. On the southwest corner of Temple Square is the Assembly Hall, a charming Gothic-style building with lovely stained-glass windows. This jewel of a building was constructed by Latter-day Saints between 1877 and 1882. The Beehive House was built between 1853 and 1855 and served as home to Brigham Young when he was President of The Church of Jesus Christ of Latter-day Saints and governor of the Utah Territory. Completed in 2009, the library contains records documenting the history of The Church of Jesus Christ of Latter-day Saints and of its members and congregations worldwide. The Church History Museum uses art and artifacts to illustrate and animate the story of the Restoration and the spiritual and cultural legacy of the Latter-Day Saints. The Conference Center is home of the twice-yearly general conferences of The Church of Jesus Christ of Latter-day Saints. Other Church and civic events, including concerts of the Mormon Tabernacle Choir, are held throughout the year. Want to know more about your ancestors? Where they came from and when? Visit the Family History Library, where you can delve into two million rolls of microfilmed records. Discover your history and experience a feeling of belonging as you explore your family tree. Records available are from the United States, Canada, the British Isles, Europe, Latin America, Asia, and Africa. A majority of the records contain information about persons who lived before 1930. Approximately 200 cameras are currently digitizing records in over 45 countries. Records have been filmed in over 110 countries, territories, and possessions. Free one hour garden tours are given May through September. World renowned gardens surround the 35 acres of the headquarters of The Church of Jesus Christ of Latter-day Saints. These gardens include 250 flower beds, more than 165,000 bedding plants, and over 700 varieties of plants from all over the world. The gardens are redesigned every six months and replanted by hundreds of volunteers. The Joseph Smith Memorial Building, formerly the Hotel Utah, was built in 1911. This stately building, which was completely renovated and reopened in 1993, now houses the Legacy Theater, reception and conference rooms, a FamilySearch center, Nauvoo Cafe, and The Roof and The Garden Restaurants. The Legacy Theater, a 500-seat theater located inside the Joseph Smith Memorial Building, is now playing Joseph Smith The Prophet of the Restoration. The world-famous Tabernacle Choir at Temple Square broadcasts a live television and radio program entitled "Music & The Spoken Word" each Sunday morning at 9:30 am. Admission is free. Guests must be seated by 9:15 am. Thursday evenings the Choir rehearsals are open to the public 8:00pm to 9:30pm, and visitors may come and go as they like. Enjoy evenings of music at year-round, hour-long concerts (bands, choirs, orchestras, soloists) in the Assembly Hall and Tabernacle on beautiful Temple Square. Concerts begin at 7:30 pm on Friday and Saturday evenings and some week nights. All performances are free and do not require tickets. The exhibits in this center focus on the temple and the importance of families in the Lord's plan for His children. This magnificent granite structure was constructed over a period of 40 years, from the laying of the cornerstones on 6 April 1853 to the dedication on 6 April 1893. The temple is considered the house of the Lord and is sacred to members of The Church of Jesus Christ of Latter-day Saints. Today Church members gather in more than 100 temples worldwide to worship and participate in sacred ordinances, such as eternal marriage.